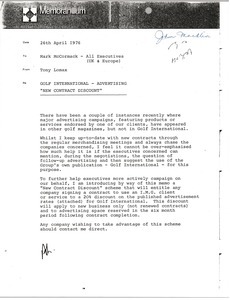 Lomax requests all executives mention the possibility of advertising in their own publication, "Golf Inernational", when negotiating with clients. 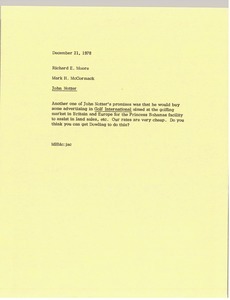 Additionally, Lomax introduces a "New Contract Discount" to be offered to new business. McCormack writes about John Notter's promise to buy some advertising in Golf International for the Princess Bahamas facility, aimed at the golfing market in Britain and Europe.